100 pupae for $2.00 - see description for bulk pricing. These flies are much larger than house flies and last a bit longer as well. They work well for all mantid species, especially those that prefer flying insects. Store the pupae in the fridge until needed. Pupae will last a few weeks in the fridge before the hatch rate diminishes. I would recommend taking any remaining pupae out and letting them hatch after 2 weeks of being stored. These hatch out best at room temp. There is no need to raise the temperature for them. In fact room temperature or slightly higher (70 to 75F) tends to hatch them out the best. 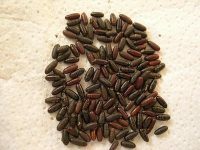 I place about 100 or so pupae into a container and allow them to hatch which typically takes 1 to 3 days depending on how fresh the pupae is. 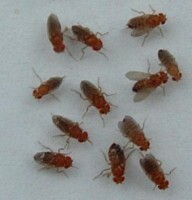 Hatched flies can be placed into the fridge for later use. When needed, place the container in the freezer for a couple minutes to put the flies to sleep. That will buy you some time to pick them out and feed your critters. Typically takes a minute or so for them to wake up. You can also place them directly into mantid containers to hatch out. That will probably be better for most keepers as transferring the flies themselves can be tricky. 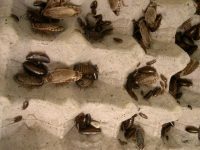 Keep in mind that flies can cause problems for a molting mantid, so try not to leave pupae or flies in the container if you notice your mantid is near a molt. There is no need to gut load flies. However, I sometimes dust them with ground up bee pollen as this is what they often would have (pollen, no necessarily “Bee” pollen) on them when caught in the wild. They also seem to like mashed banana. Try not to overthink it. We all know the kind of stuff they eat in the wild! Please contact me for orders of 1000+ pupae for pricing.